From Our Archives: Do You Know Me? 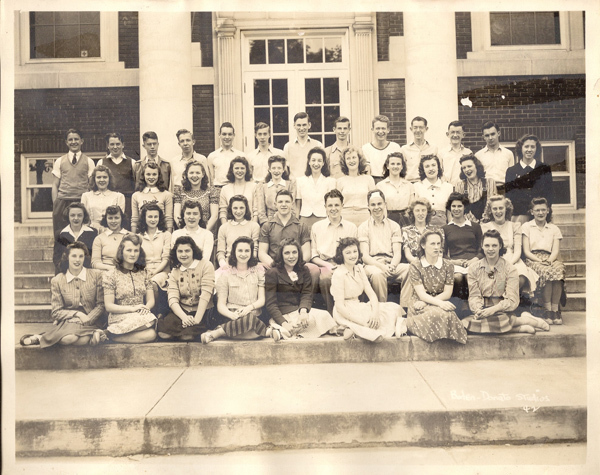 Thank you to Mary Calley Henry (Mrs. Don Henry) who donated this photo of the Walden High School, Class of 1942. Former Trustee, Don Henry, is the smiling fellow with the bandaged head in the second row! Along with this photo, she donated several issues of the Nedlaw yearbook from 1939, 1940, 1941, ("No yearbook in '42 because of the war," said Mary), and 1943. Larger PDF of this file--to download, "right click" your mouse to save to your own computer. Any with a question mark are best guesses. Let us know if you recognize anyone. Bob Rauner; Clarles Playne; Tom Verity; Clarence Walsh; __?__. 3rd row: __?__; __?__; Betty Birch; __?__; __?__; __?__; __?__; __?__; __?__; __?__; Helen Purvis? 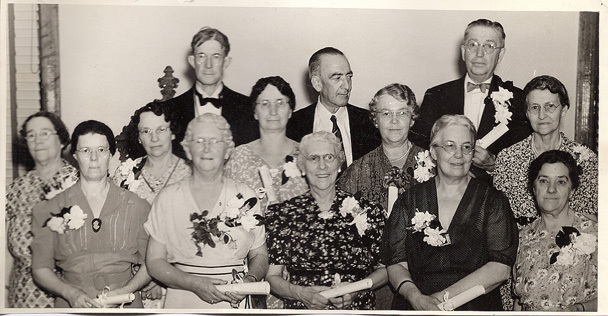 This handsome group of Waldenites, might be the Eastern Stars group, the women members of the Masons. So many faces look familiar--but we have no names or date. Please do let us know if anyone looks familiar. Two photos appear to be of the same house and family. Undated and no further info. 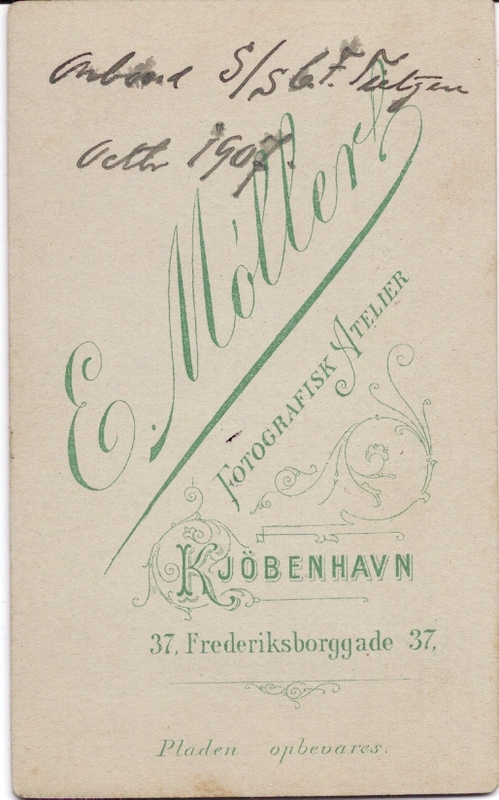 These two photos show "E Móller, Fotografisk Atelier, Kjöbenhavn, 37, Frederiksborggade 37" printed on the reverse, with one handwritten note on the back of the family picture reading, "Onboard S/S C.F. 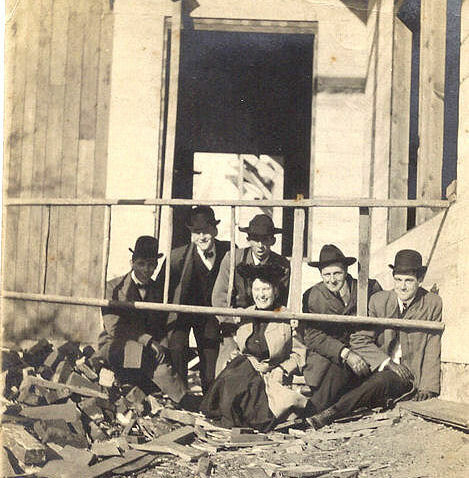 TIETJEN, October 1907"
This photo from our archive appears to be a construction site. Someone at a later time added a note that this may be the Borden Home. Look Familiar? We would love to hear from you! A lovely afternoon get-together on a porch. 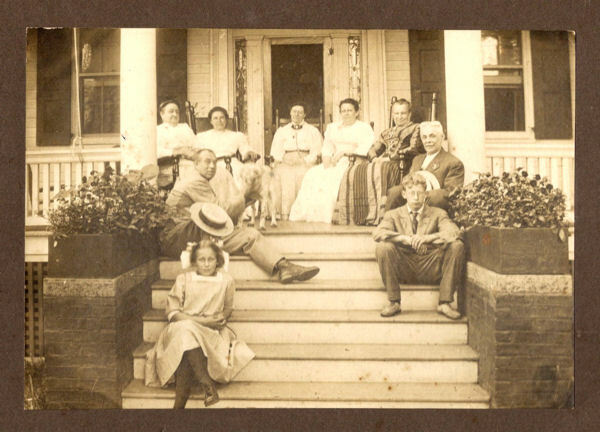 No names or dates--anyone know this family or the house? 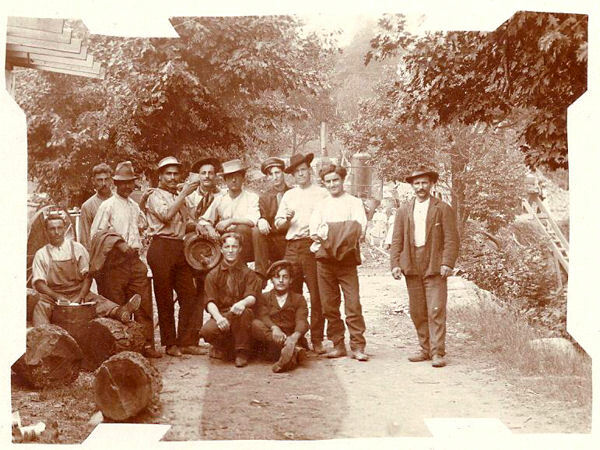 This one may be of employees of one of the knife shops. Interesting equipment behind them.